Al Gharafa Doha (D1) tabbed 29-year old American guard Franklin Session (187-79kg-89, college: CS Los Angeles). He played in the summer at CitiTeam Blazers (The Basketball Tournament) in the U.S. The last season Session played at The Storm in Canadian NBL Canada where in 41 games he averaged impressive 20.0ppg, 9.4rpg (#2 in the league), 5.5apg and 1.8spg (in top 4). He can count that season as a very successful as was awarded USBasket.com All-NBL Canada Newcomer of the Year and selected to USBasket.com All-NBL Canada 2nd Team. In 2011 he was drafted by Los Angeles D-Fenders (D-League) in sixth round (16th overall). 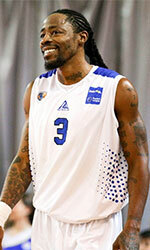 The former Cal State - Los Angeles (NCAA Div.II) standoutis in his eighth season in pro basketball. Among other achievements his team made it to the WCBL Semifinals in 2011 and 2013. Session has played also professionally in NBA G League (South Bay Lakers), ABA (LA Slam) and IBL (Santa Monica J. and Agoura Hills E.). Let's have closer look into His outlook: Tremendous athlete who gets to, and above, the rim quickly. Franklin is an explosive player who can score from anywhere on the court, on the perimeter or driving the ball to the basket. He is especially dangerous in transition and in the open court. Franklin is an amazing athlete who rebounds the ball like a bigger player. Uses his quickness and length to plays passing lanes well and will block shots, both on ball and defending the basket.